In Figure 1.5, the distinction between horizontal and vertical information flows was introduced at a conceptual level. Perhaps now is a good time to review the concepts shown in Figure 1.5 and enhance that figure based on our study of information systems. Figure 15.4 is designed to do exactly that. 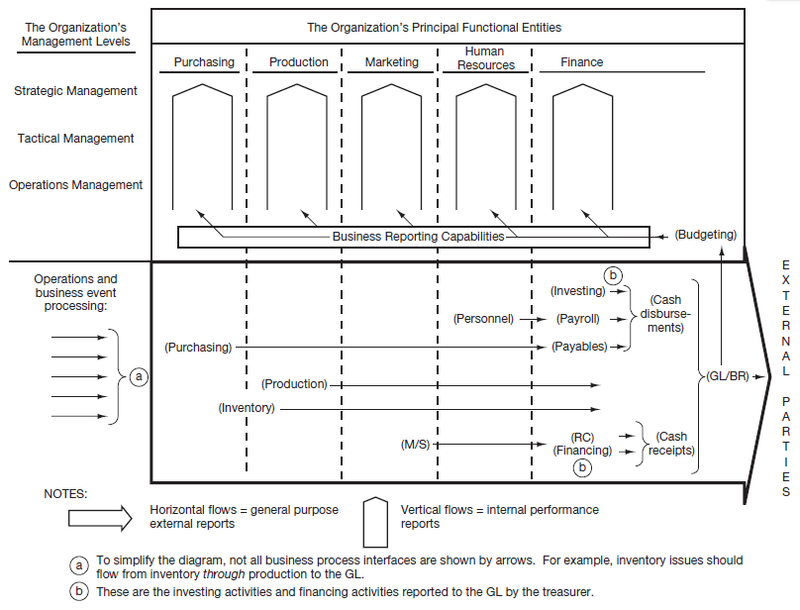 Along the bottom of Figure 15.4, we can trace the horizontal business event data flows as they progress from left to right through the various operations processes, culminating in the general ledger or BR databases, and resulting in external business reporting. We also see the vertical reporting dimension (in the form of internal performance reports prepared from information supplied by the general ledger, the BR database, and through budgeting) flowing upward in each of the principal functional columns. Again, note that in an enterprise system environment, the distinction between the general ledger and BR databases vanishes, and all business event data can be used as the basis of managerial reports in support of vertical information flows. Case 1 Vivendi is a French company that provides media, communications, and environmental services in more than 100 countries. The success of its business units is based on predetermined key performance indicators. The company recently implemented a management reporting system to support budgeting, forecasting, legal decisions, and operational management to replace its older budgeting and reporting systems. It uses Cartesis OLAP technology to analyze 20 analytical dimensions in a flexible way over the Web. Cartesis also supports corporate planning, performance management, and financial consolidation. The system combines five years of historical data with budget information to quickly support a wide range of decision makers. Case 2 Before installing a business intelligence product called Cognos Finance 5.1, Standard Pacific Homes had to consolidate many Excel spreadsheets to be able to provide quarterly reports and budgets to its financial decision makers. Using Cognos’ tool to streamline financial processes has cut almost a week from the time it previously took to provide these reports, resulting in more time for reviewing the budget and making informed decisions. Financial data is now available real-time, so that analysis of the margins for each housing project underway at the firm can be reviewed before the end of the quarter. Sources: http://www.cartesis.com/cartesis.htm, as of June 2001; http://www.cognos.com/news/releases/2001/0730.html as of September 2001.